#MZT98 - Twittercast from Fairfax, CA 10/23/10 - Links to music!!! 19 Broadway in Fairfax is home to us . . . and especially to Barry, who lives right down the street. At the time of this gig, Ann had just had a malignant melanoma removed from her foot, which she had to keep elevated above her heart for more than a month. Our tribe is a matriarchy, so turning the boys loose without supervision was risky. In this case, it worked out pretty well, possibly because Ann was watching us on MoonaliceTV.com!!! 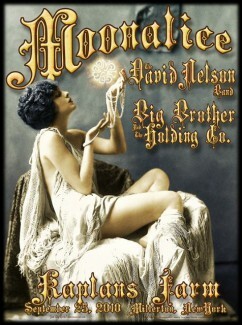 We are starting to fill in the early part of 2011 with Bay Area and Arizona dates. We hope to see you there!!!! 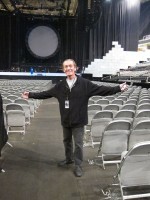 #MZT97 - Twittercast from Milwaukee, WI 5/27/10 - Links to music! If you haven't seen Spinal Tap, you must. One major scene takes place in Shank Hall. 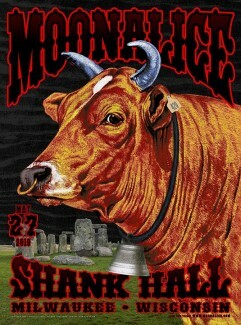 The current Shank Hall shares only the name and one important detail - Stonehenge - with the movie venue. Stonehenge sits over the drum riser, evidently to keep drummers from exploding. We went to a Brewers game while we were there. The sausage race during the 6th inning was fantastic! The Mint is one of the coolest venues anywhere. Set up like a cabaret, it has comfy chairs, booths, and lots of small spaces to hang. We love playing there . . .
GE Smith sends his love to the Tribe!!! Blue and Chubby went to San Jose to see The Wall tour. It was an amazing show, but the highlight for us was seeing our pal Hardwood (G.E. Smith), who is playing in Roger Waters' band. 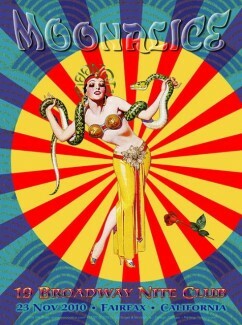 In classic Moonalice tradition, GE is mostly playing bass!!! Yes!!!! He sends his love to all in the Tribe!!! Two Bay Area Shows Added in January!! 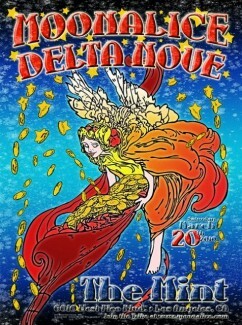 We will be playing in Berkeley on January 14 and in Felton on January 15. It's 4:20 Somewhere: 600,000 downloads!!!! There have been more than 600,000 downloads of "It's 4:20 Somewhere"!!! Thank you so much!!! Due to circumstances beyond our control, we will not be touring in the northeast this December. We look forward to seeing all of you in the coming year. #MZT95 - Twittercast from Kaplan's Barn, Millerton, NY 9/25/10 - Links to songs!!! According to Moonalice legend, the three silos at Kaplan's Farm in Millerton caused a huge international crisis in 1962. The Millerton Missile Crisis began when the Russians and Cubans tried to install nukes on a farm in upstate New York. The crisis evaporated when no one could find Millerton on a map. #MZT94 - Twittercast from Red Square, Albany, NY 9/18/10 - Links to songs!!! 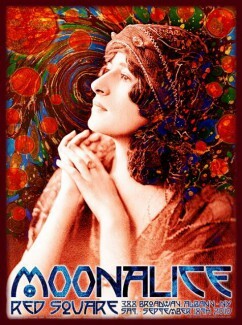 According to Moonalice legend, after the fall of the Iron Curtain, some clever Moonalice decided to move Red Square from Moscow to Albany, NY, where it is now a music venue.